Arguably the most important element in any successful business is employee retention. Yet businesses each year note their struggles in this area and then there is the alarming statistic that 32% of businesses are blind to the fact this is even an issue. While companies try and test methods for staff retention there is one factor that regularly is attributed to providing a beneficial outcome across multiple industries and businesses, no matter how big or small. Time and time again employee recognition comes out on top for being one of the drivers of employee satisfaction. It’s no surprise that employees value recognition. Reports and survey results show some rate it so highly it has overtaken financial or salary rewards. While traditional employee recognition has been in the form of an awards presentation or bonus at the end of the year, the landscape is fast changing. The digital age is asserting its influence on recognition/rewards programs and employee rewards are no exception. Digitisation is seeing an increased use of social instant messaging platforms such as Facebook messenger for work but, employee benefit processes are also changing. We are now entering an era of instant gratification and being able to instantly reward employees with something like e-gifts is a growing category. Through working closely with many of our corporate partners and seeing their needs, we have pulled together the top 3 trends to look out for below. Recognition schemes are becoming more than salary and monetary benefits. Businesses are integrated formal reward and recognition schemes into online employee benefits portals. 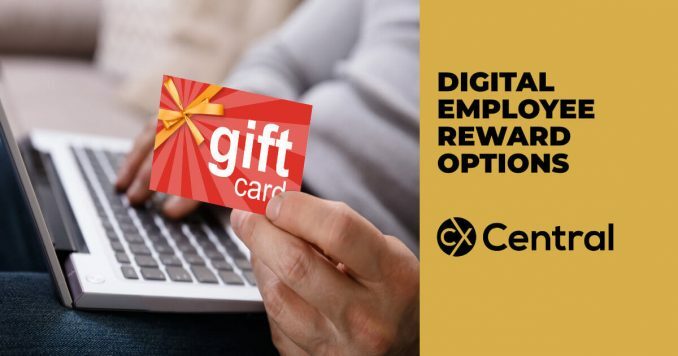 Initiatives may include things like employee-nominated training and development, digital gift cards, lifestyle-based rewards or experiential opportunities. These can all be claimed and monitored through the employee portal. These staff recognition schemes motivate and engage staff; they acknowledge their good work and their successes. They’re cost effective and they encourage higher rates of staff retention and foster a strong corporate culture. Social platforms such as Facebook business pages, LinkedIn or even internal networks such as Yammer or Slack mean managers and employees can publicly recognise their colleagues, which is an important part of many recognition and reward strategies. For the savvy employees among us, the platforms will be bespoke, allowing for collaboration between employees and further engagement, for example, the ability to like, share or comments on the achievements of others. The visibility and user-friendly nature of these social platforms mean people are much more likely to recognise their colleagues, and the fact that it’s public means employees, even the most humble among us, will feel just that little bit prouder. Everybody wants to know that they’ve been seen and heard. No matter what their position in the company, an employee loves the idea that the big boss knows who they are and what their interests may be. Personalised acknowledgements are a far stronger motivator than impersonal rewards; a much stronger motivating factor when it comes to productivity and willingness to go above and beyond. So it’s shouldn’t come as a shock when we say that the best employee awards are tailored to the culture of the company and the personality of the individual. If it’s an experience, it’s one that you know the employee will enjoy and appreciate. If it’s a digital gift card, the imagery and messaging relate directly to the individual. Make sure it is personal and demonstrates the value that the individual has contributed to the organisation.